From the Sioux City Journal…. 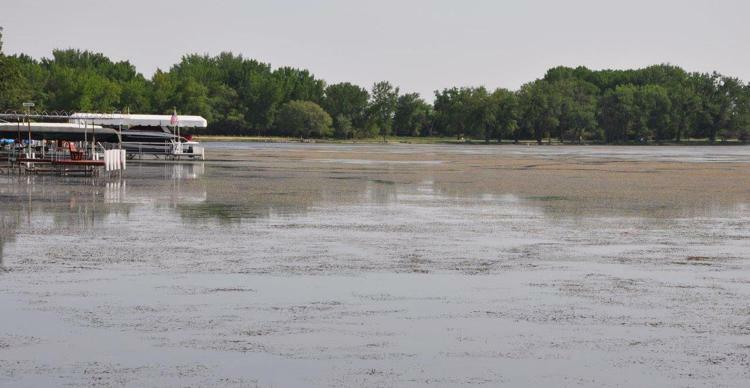 OKOBOJI, Iowa — Vacationeers returning to Okoboji this weekend again have been greeted by an invasive weed that threatens to curtail boating, fishing and other activities on some of the Iowa Great Lakes. The later than usual thawing of ice in the Dickinson County lakes delayed the blooming of curlyleaf pondleaf, but the weed still tops out in portions of East Lake Okoboji and some other lakes, said Mike Hawkins, fisheries biologist for the Iowa Department of Natural Resources. Curlyleaf pondweed, a non-native plant, was first discovered in the Iowa Great Lakes more than 70 years ago, but it has emerged as a major nuisance for lakefront owners and boaters on East Lake Okoboji in recent years. Unlike native aquatic plants which germinate in the spring, the plant germinates in the fall as water temperatures drop. Longer, milder fall seasons contribute to the plant’s “head start” for growth, Hawkins said. In waters 10-12 feet deep, such as Big Spirit Lake or West Okoboji Lake, Hawkins said the pondweed is not as visible as it’s several feet below the surface. In shallower portions of East Okoboji Lake, however, the weed makes it to the surface and creates dense mats which can cause problems for navigation. A weed management plan developed by a community group last fall has been implemented. The first step was to treat two, 10-acre areas in the north bay of East Lake Okoboji and Lower Gar Lake with a herbicide. Mechanical harvesting of the plant also has started, with the goal to clear 40 acres, up from 20 acres last year. The management methods are strategically placed to create lanes for boat traffic and ease access to public ramps and private docks. Hawkins noted some homeowners and boaters have expressed concerns about plants washing to share and piling up around docks and hoists. He noted that a lot of loose pondweed was floating on the surface after ice retreated from the lakes on April 26, the latest date since 1951. Homeowners and boat owners on Iowa’s lakes are prohibited from using their own chemical herbicides in public waters. Hawkins said homeowners who notice the weed around their docks can remove the material by hand raking it, hand pulling it or have it mechanically harvested around their docks or hoists. Transporting the material, however, requires a permit. Hawkins said, in general, aquatic plants are good for the ecosystem and even curlyleaf pondweed benefits the water quality.